The loss of Peyton Manning has done more than dash the playoff hopes of one of the NFL’s premier franchises. Demand for Indianapolis Colts tickets has plummeted in his absence as the struggling 0-6 team looks for its first regular season win. At SeatGeek, we sifted through our data to see exactly how much of an impact Manning has on ticket prices. According to the data, Colts ticket prices have dropped by 48% since Manning suffered a setback in his recovery from neck surgery. 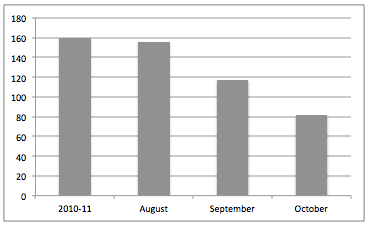 Demand in August was consistent with averages from the 2010-11 season, but once Manning failed to suit up it seems fans weren’t as excited about seeing the on-field product. From average ticket prices of $156 in August, the team’s shocking decline in September ($117) and October ($81) has halved the value of a Colts ticket. There’s the ‘Strasburg Effect,’ the ‘LeBron Effect,’ and even the ‘Vick Effect,’ but no one can match Manning’s impact both on and off the field. He may not play a down this season, but Manning is undoubtedly our ticket demand MVP.